The Stewart Island Shag (Phalacrocorax chalconotus) also known as Bronzed Shag or Stewart Shag, is a species of shag endemic to the southernmost parts of the South Island of New Zealand, from the Otago Peninsula south to the Foveaux Strait, and to Stewart Island, from which it takes its name. The species is dimorphic in appearance. Roughly half the individuals are mostly dark bronze, but with white patches, similar to the King Shag; the remainder are bronze all over. The two phases breed together indifferently. The birds are up to 70 cm in length. 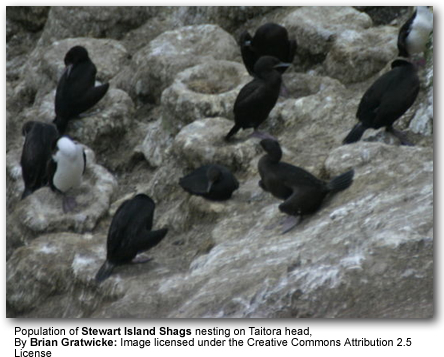 Stewart Island Shags breed colonially, making raised cup nests out of organic material and guano. Colonies are large enough to be strikingly visible, and are used year after year; there is a notable one on the northern shore of Taiaroa Head at the mouth of Otago Harbour. They feed in coastal waters, rarely if ever being seen inland or far out to sea. They are related to the other blue-eyed shags.